Each adapted to their own national context, the pilot projects in the European ATD Network work with a range of migrant cohorts to provide case management as an alternative to immigration detention. They to explore how alternatives based on engagement can reduce absconding and work towards case resolution, meeting the needs of migrants and States. The pilots aim to generate evidence and models for effective alternatives, in order to initiate discussions and partnership between civil society and governments around shared interests in fair and effective immigration systems in which immigration detention is only used as a last resort. The Case Management team will engage over two years with a total of 50-60 migrants with return orders, providing holistic support on an individual basis, with the goal of avoiding the need to detain them and decreasing the risk of absconding, while helping them stabilize in the community until case resolution (obtaining legal status or return to country of origin or third country) is attained. The project aims to promote the adoption of alternatives to detention in Cyprus, through the use of a holistic approach, that includes capacity building to governmental and non-governmental stakeholders, advocacy on the adoption of ATDs and case management to 40 cases based on the Revised Community Assessment and Placement (CAP) model, developed by the International Detention Coalition (IDC). EPIM’s policy update July 2017, page 10. 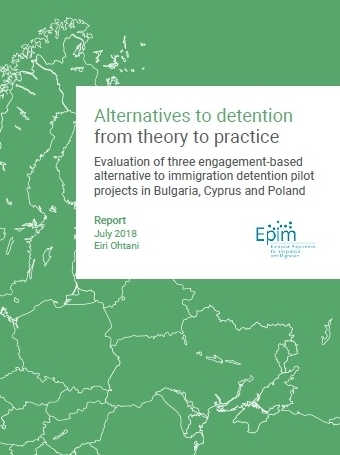 The project aims to promote and expand the use of alternatives to detention in Poland by introducing an engagement-based case management model based on the Revised Community Assessment and Placement (CAP) model, developed by the International Detention Coalition (IDC). The project team will engage a minimum of 25 migrants in return procedures who were released from detention or were imposed ATDs, supporting them through holistic case management, legal aid and psychological care.